On March 29, the Cuban Government issued a license to invest in the Mariel Development Zone for ViMariel SA – the first fully foreign-invested enterprise in Cuba invested by Viglacera. The two governments expected that this will strongly improve to the economic development of the Caribbean island. The award ceremony took place in the presence of the Minister of Industry and Trade of Vietnam, Mr. Tran Tuan Anh and the Minister of Cuban Ministry of Foreign Trade and Investment, Mr. Rodrigo Malmierca Diaz at the Business Forum in La Habana, in the context of the State visit of the General Secretary of the Central Committee of the Communist Party of Vietnam – Mr. Nguyen Phu Trong to Cuba. Besides, Viglacera’s General Director, Mr. Nguyen Anh Tuan has also signed other important cooperation documents with his Cuban partners following Viglacera’s investment strategy in the Republic of Cuba in the near future. 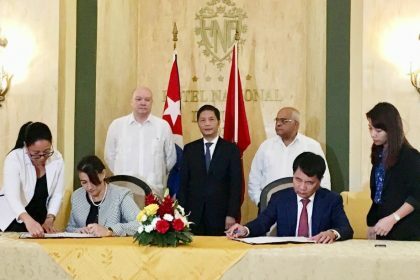 Accordingly, Mr. Tuan signed the agreement of investment in Viglacera Industrial Park development in Mariel Special Zone with the General Manager of Mariel Area Management Office – Mrs. Ana Teresa Igarza Martinez; the written agreement on investment cooperation Neptuno – Triton tourist complex in La Habana with Gran Caribe Corporation. Speaking after the signing ceremony, Mrs. Igarza said it was part of Cuba’s effort to call for foreign capital to serve the development of infrastructure needed for potential investors in the Caribbean island . According to the agreement of investment in Viglacera’s Industrial Park development in Mariel, Vietnamese enterprises will invest about $300 million to build a 160 ha industrial park in the next 5 years (from 2019). 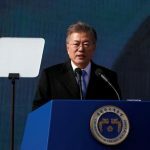 It will have adequate infrastructure for roads, telecommunication, electricity and water supply networks for industrial facilities and Vietnamese enterprises will have the right to exploit this park for 50 years. It is expected that ViMariel S.A’s industrial park will attract investment by logistics, biotechnology, pharmaceutical, electronics and manufacturing businesses. 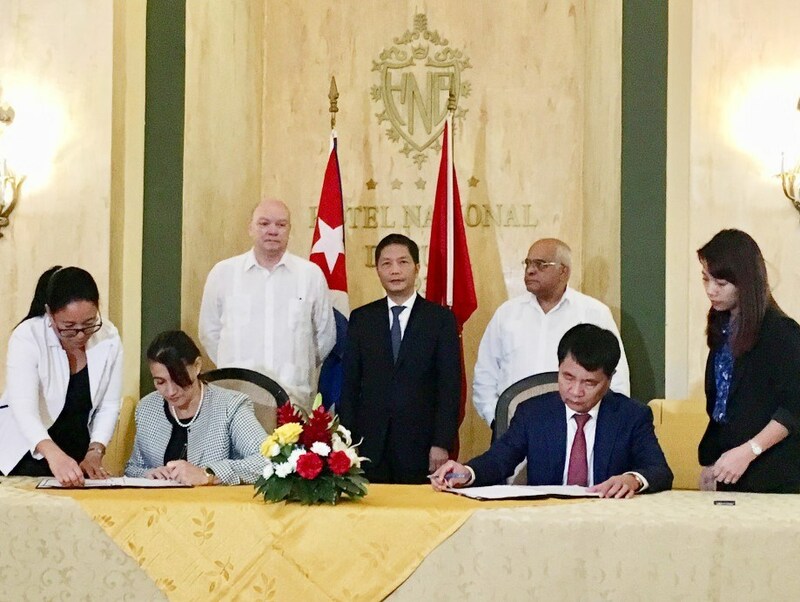 Also on March 29, Mr. Tran Anh Tuan, Chairman of Chao-Vig Corporation, a member of Viglacera Corporation, signed an agreement to develop the Celadon – New York Hotel in La Habana with Gran Caribe – Cuba Corporation. In the field of investment in construction materials in Cuba, Viglacera Corporation JSC has worked with the Santa Cruz tiles factory and San José sanitary wares factory. Santa Cruz tile factory, the only factory in Cuba producing ceramic tiles for the entire country’s demand, is invested in technological lines of Siti (Italy), put into operation in June 2008 with the capacity designed for 3.141 million square meters per year. San José sanitary wares factory produces sanitary wares and tiles. In particular, the sanitary ware lines were invested with the technological of an Italian brand, Sacmi, which was put into operation in 2007 with the designed capacity of 154,000 products per year. The signing of a joint venture contract and the signing of the joint venture charter between Viglacera and the two factories will take place during the Fecons International Exhibition, from 3 to 6 April, 2018 in La Habana, Cuba. Viglacera booth at the Fecons International Exhibition, from 3 to 6 April, 2018 in La Habana, Cuba. Viglacera delegation’s visit, led by General Director Mr. Nguyen Anh Tuan was a success, unveiling different directions and steps in Viglacera’s operation cooperation, business and investment in Cuba.